On Monday night’s episode of WWE Raw, fans saw a variety of matches and segments, but fans watching on TV missed what happened after the show ended. During the night, fans in attendance or watching at home saw John Cena give a final attempt to call-out The Undertaker. Despite loud chants from the fans and more taunts from Cena, Taker was once again a no-show. In addition, WrestleMania 34 opponents Brock Lesnar and Roman Reigns met in the ring during the final segment of the night. Reigns would hit Brock with a barrage of Superman punches, only to fall to Brock’s F5 finisher. That left Reigns down on the mat as Raw went off television, leaving some doubt over if he’d be in any condition to compete in the WWE Universal title match on Sunday. After that, more happened involving Reigns and Cena, but television viewers didn’t see it. The Wrestling News Source reported on the post-show segment, which involved Roman Reigns already reeling in the ring from the F5 Brock hit on him. 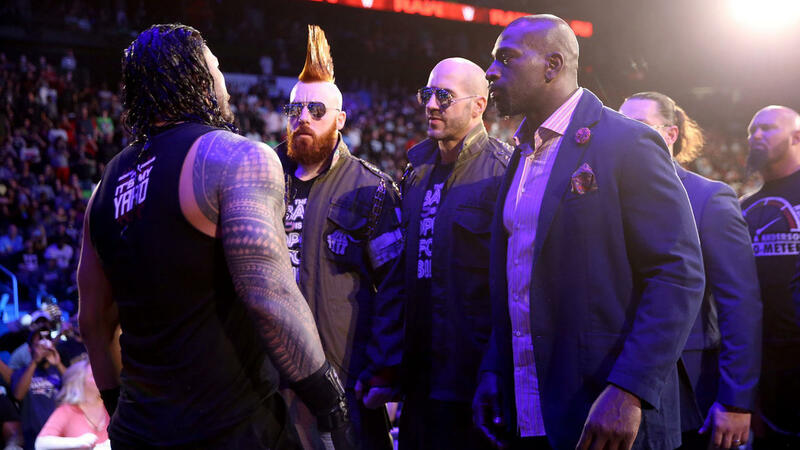 Since Reigns was vulnerable, it provided an opportunity for current Raw Tag Team champions Sheamus and Cesaro to strike. The Bar hit the ring after they had earlier stepped aside for Reigns to go after Brock Lesnar. This time around, they attacked Reigns in the ring, possibly taking out their frustrations on him after their incident with Braun “Brains” Strowman earlier in the night. Luckily for Roman Reigns, he received some assistance in the ring. John Cena said he’ll be attending WrestleMania 34 as a fan this Sunday, so he may have wanted to make sure he could enjoy the WWE Universal Championship match. Cena rushed out to the ring to help out Reigns. With “The Big Dog” back on his feet, he was able to hit a Spear as Cena hit the Attitude Adjustment on one of the tag champs at the same time. Could there be a future team-up coming for Cena and Reigns after WrestleMania? One fan tweeted a video clip showing what happened in the post-Raw segment on last night’s show. John Cena, Roman Reigns, and The Bar will all be present at Sunday’s WrestleMania 34 pay-per-view, but so far, only a few of them have their matches set. Roman Reigns will take on Brock for the Universal title, while Sheamus and Cesaro defend their tag titles against Braun Strowman and a partner of his choice. Meanwhile, John Cena is hoping that The Undertaker finally shows up to face him so he’ll have a match on the card too.